We are excited to announce that the recently completed design for a new garden event center in Naples received the top (“Honor”) award in the Unbuilt Work category from the American Institute of Architects Florida Southwest. Each year, an independent jury selects a handful of projects by local architecture firms in categories like new work, renovations/additions, and unbuilt work. This year’s guest juror was the firm of Shulman + Associates out of Miami. 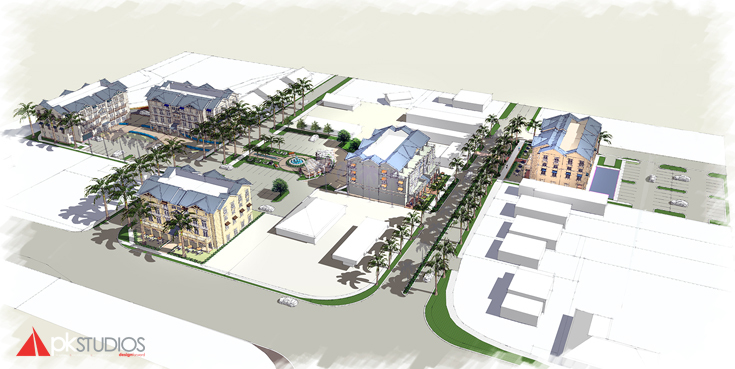 An important step for downtown Bonita Springs! On August 15th, the Bonita Springs City Council voted 6-1 to grant final rezoning approval for this 3.4-acre parcel in the heart of downtown Bonita. Located at the intersection of Terry Street and Old 41, the project will consist of five new mixed-use buildings and a public park area and kayak launch. Construction plans are underway and the developer plans to break ground within the next 6 months. PK Studios is providing architectural services for the project. Our website was updated in April 2018 to give you a better user experience! Thank you for visiting.